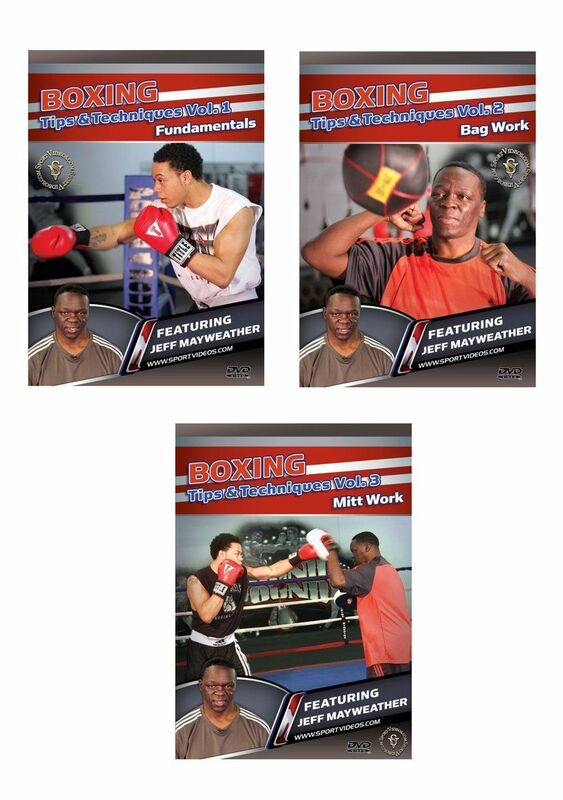 This set includes all three DVDs featuring Jeff Mayweather. In this program, Mayweather teaches how to perfect the offensive and defensive fundamentals of boxing. Among the topics covered are: stance, three different types of jabs, the right hand, the right and left hooks, the uppercut, combinations, parrying, catching with the elbows, evasion techniques and shadow boxing. The special features section covers conditioning with instruction by Melissa Littlejohn. 35 minutes. 2011. In this program, you will learn various tips and techniques for working the heavybag, double-end bag and speedbag. You will also learn how to use these bags to simulate boxing a real opponent so you can transfer these skills into the ring. The special features section covers conditioning with instruction by Melissa Littlejohn. 30 minutes. 2011. In this program, Jeff teaches you everything you need to know about using the mitts to prepare a fight Among the topics covered are: the jab, right hand, hook, uppercut, tips for trainers, defense and how to put it all together. The special features section covers conditioning with instruction by Melissa Littlejohn. 28 minutes. 2011.